Now that spring is here, it's the perfect time to dress up your outdoor space. Use these creative ideas for the four main elements. Create a deck with inexpensive wooden tiles that slot together for quick and easy assembly. Area rugs are as versatile a choice for balconies and patios as they are for indoor rooms. There is a wide range of indoor/outdoor rugs, or you could use carpet squares to create your own design. Another DIY option is applying a polyurethane finish to a colorful printed tablecloth. Base your lighting choice on your planned use of the area. Do you just want ambiance, or will you need a stronger source for reading and writing? String and rope lights are virtually tailor-made for outdoor spaces. They come in an infinite number of designs from clear bulbs to whimsical shapes like chili peppers. Some are even Bluetooth-enabled so you can enjoy your playlist as you relax outdoors. Mason jar lanterns are simple to make and cast a soft, soothing glow. A bistro table-and-chair set is a classic choice for a patio or balcony. It's practical yet charming, and the size is right. Wooden crates are the heroes of DIY furniture, and the same holds true outdoors. Attach cushions for some simple bench seating or stand one on its end for a table with handy storage. Antique furniture provides a cozy, lived-in feel. Check resale and consignment shops for pieces that might need just a little TLC. If you have a balcony, save room by using a planter that hangs from the railing. Take advantage of the spot with trailing plants such as begonias and English ivy. 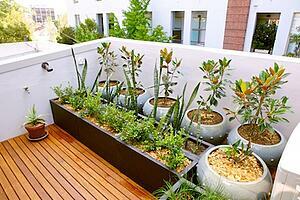 Stagger the height of plant containers to add visual interest. Add splashes of color with accessories like cushions and throw pillows. Want a bit more privacy? Add a folding room divider or make your own canvas drop screen. Are you ready to enjoy the outdoors in style? Share your favorite patio or balcony decorating tip in the comments!